Why do stuntmen not have an Oscar? As the big names of the movie industry tackle that all-important question of what to wear to the Oscar ceremony on Sunday, there is one group of people who are still waiting for their invitation. But why do stuntmen (and women) not have an Oscar category? Many of the films which are tipped for Oscar glory - Life of Pi, Django Unchained and Skyfall to name a few - have relied on the spectacular work of the stunt team to capture the imagination of the viewing public. There are hundreds of stunt performers who, despite great improvements in safety over the years, still risk life and limb to enhance the cinemagoing experience. Jack Gill has been setting himself on fire and crashing cars in the cause of entertainment since the mid-1970s. He has worked with some of the biggest names in the movie industry. For more than 20 years, Gill has also campaigned for stunt co-ordinators - the head of a film's stunt department - to get the recognition he thinks they deserve from the Academy. The sense of injustice he feels watching Oscar night is clear when he speaks. He says: "It's disheartening because you've put your life and blood through it. "You're sitting by yourself watching all the other department heads, and you're not in there with them. "Every single successful stunt co-ordinator I know has been sitting at home watching his film winning an Academy Award and he's not part of it." So every year since 1991 Jack Gill has petitioned the Board of Governors of the Academy to include a new category for Stunt Co-ordinator. A simple majority vote of the board members is needed to add a new award, but every year the same result comes back, despite some high-profile supporters. Gill says: "When I got Steven Spielberg and Jim Cameron and Schwarzenegger and those guys signing a petition; once I took that into the Academy, I thought they would see that all of these eminent people really believe that we deserve this. "It's voted down every year. I'm baffled." So why do the Academy keep saying no to creating a category for stuntmen and women? One suggestion is that most people, even in Hollywood, already believe stuntmen get their own award - one which is not televised in the main ceremony. Another possible reason is internal politics. The Academy is made up of people who work in all the branches of film-making who are honoured - from hair and make-up, to the directors and actors. Those leading the campaign, including Jack Gill, are convinced members are worried that creating a totally new award could lead to their own category being dropped from the live TV awards show - which is often criticised for being too long. Gill says he has told the Academy Board that is not an issue. "We don't even want to be part of the televised show," he said. Gill adds: "You can give us our award the day before in a hotel room banquet hall. Anything, so we at least have some acknowledgement." Ben Bray's work this year is once again within touching distance of a golden statue. He was the stunt co-ordinator on director David O Russell's film Silver Linings Playbook, which has 8 Oscar nominations, and worked on another film in the running for Best Picture, Argo. He has no explanation for the reluctance of the Academy to reward stunt folk. He says: "I always question why. I think simply the Academy still wants middle America to think that their heroes, the actors, are actually doing their own stunts. "It would be a wonderful thing to see the public and moviegoers love their stuntpeople as much as they love their actors. I really think that the public would embrace the stuntmen and women as heroes themselves but then again maybe that's not what the studios really want." That complaint, that actors take all the credit, is not a new one. Even the 1980s American drama series The Fall Guy - where Lee Majors played a crime-solving Hollywood stuntman - had a theme song to that effect. Charlie Croughwell is another A-list stunt co-ordinator who worked on Life of Pi, also nominated for Best Film this year. He thinks the audience's understanding of the film-making process means that argument against a stunt Oscar is not credible. "I don't think the audience is that gullible any longer," he says. Croughwell has co-ordinated many blockbuster films, including Knight and Day, which starred Tom Cruise - an actor who likes to use his action credentials to sell a movie. But he said that also brings an added pressure on the stunt co-ordinator. He says: "Now you have the lead actor in the film who is going to do some pretty hairy stuff, and Tom does some pretty hairy stuff. He could get injured or even killed. So I love those guys, but at the same time you have to understand what their limitations are. "If Tom wasn't an actor, he'd be a hell of a stuntman." 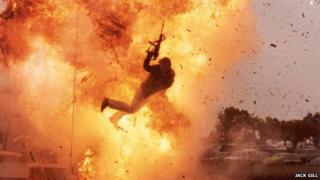 Depending on the story being told, the involvement of the stunt team can be minimal, or it can be integral to the film-making process. Croughwell's involvement on Life of Pi began more than a year before shooting, and since the story revolves around a shipwreck, with much of the action taking place out on the ocean, lots of his work was water-based. As well as teaching the director, Ang Lee, to become a certified diver, Charlie and his team faced another big potential hurdle. The actor in the title role, Suraj Sharma, could not swim. It was up to Charlie's stunt team to teach him, and make sure he looked confident in the water on-screen. Charlie says: "I feel that we were an integral part of building that character of Pi, with Ang's guidance. "On Life of Pi our involvement in the process of character development was extensive. Any time he's in the water, any time he's doing anything physical, when he's on the boat, when he's balancing, his weight gain, his weight loss; that was all part of the stunt department." Ben Bray says: "We are just as involved with the filming process, hand in hand with the director and producers, as much as a director of photography, special effects, make-up, and set designers. "I'm fortunate to have two of my directors acknowledge how important we are - both David O Russell and Joe Carnahan are big supporters of this campaign." Feelings clearly run deep in the tight-knit stunt community. Some have suggested that stunt co-ordinators turn up on Oscar night, dressed in their tuxedos, to stage a protest outside the Dolby Theatre where the ceremony is held. But they simply do not want to divert attention from any of the nominees, any of their colleagues, who are having their moment in the limelight. There have been victories. The Screen Actors Guild has included an award for stunt work since 2007, and the stunt community hold their own annual ceremony. Last year the veteran stuntman Hal Needham was given a lifetime achievement Oscar for his contribution to the industry. A handful of other stunt performers have received a golden statue, mostly honorary, for their contribution to safety. One of those is perhaps the industry's most famous stuntman, Vic Armstrong. He has appeared on screen as a stunt double for James Bond, Superman, and most famously Indiana Jones. Despite his success he is still angry at the continued snub for his colleagues. He said: "I feel pretty strongly that we are being pushed to one side regarding the Academy Awards. We will keep fighting though." While no-one knows how this year's Oscars are going to turn out, one thing is clear; soon after the parties are over and the spotlight dims on another awards season, a letter will arrive at the Academy offices, made out in the required triplicate, outlining the case once again for stunt co-ordinators to get their moment in the limelight. Jack Gill says: "Winning an Academy Award does bring with it a lot of respect. I think we want it just to be recognised within our peers. "I've been doing this since 1991 and I'm not going to stop now."